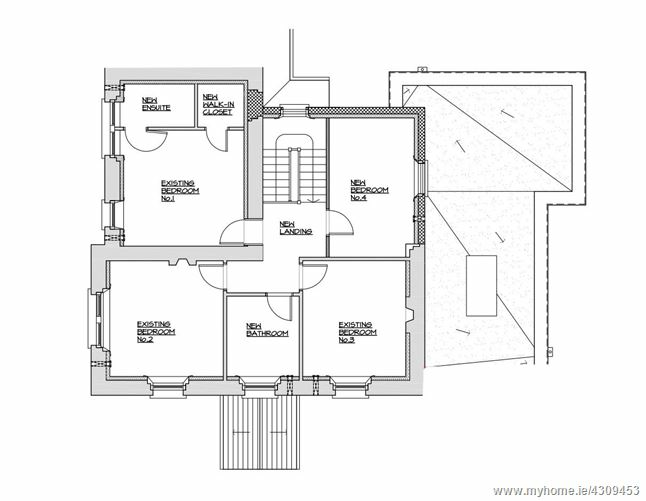 Zoned heating system including under floor heating to ground floor.  All original walls have been insulated using a breathable dry lining system.  Handmade internal panelled doors, architraves and skirtings.  Hand painted traditional kitchen with granite tops and modern A rated appliances.  Traditional black and white tile (chess board pattern) to entrance hall. wall finish and floor finishes. profile tray and power shower. 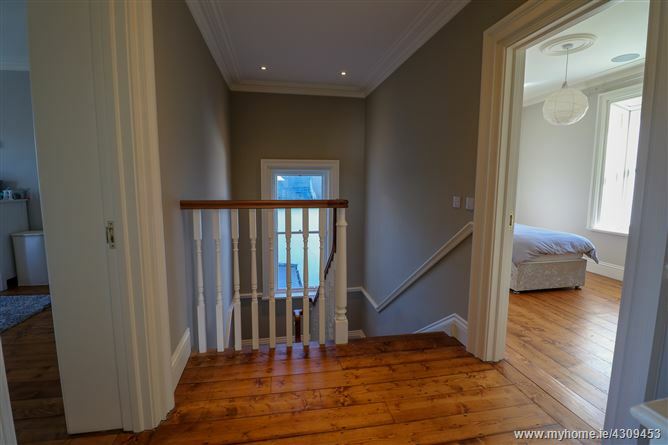  Original re-installed / refurbished timber floors to the first floor.  Plaster cornicing to all rooms.  Ornate cornices in all rooms.  Security system installed throughout the renovated / extended house.  Exterior electric gates to front parking area.  Parking for two large cars. 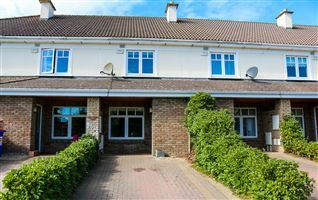  Private landscaped south east facing rear garden.  Newly installed timber up & down sash windows with draft stripping and cords.  Exterior boiler house containing boiler / water tanks and water pump. McGovern Estates is proud to present Bushfield House to the market. This remarkably elegant period residence has been completely refurbished with great flair and impeccable taste to exacting standards and now provides 2500 sq.ft. (approx.) 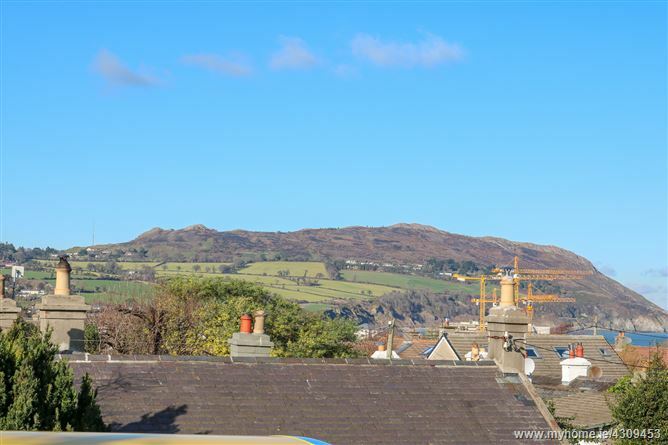 of stunning light filled and flexible accommodation in one of Wicklow most prominent locations. Being exceptionally well designed and finished to a superior standard, the property incorporates all modern amenities, with the benefit of retaining many of its period features. Every inch of both the interior and exterior has been carefully designed and wonderfully executed to provide the highest standard features including underfloor heating, interior insulation, custom made triple glazed sash windows and ornate decorative covings, cornices and architraves to name but a few. Bushfield House offers a rare opportunity to acquire a family home that provides the height of exclusive living whilst enjoying a vast array of amenities that are available on your door step. Internal viewing of this property is highly recommended. The property is approached via an electric gated entrance on to a gravel driveway which provides off street parking for up to three cars. A solid wood front door then leads to large entrance hallway with wonderfully high ceilings and features a bespoke floor to ceiling book shelving unit. Off the hallway on the ground floor there are two large reception rooms which both feature original fireplaces and large sash windows with ornate decorative covings and cornices. The rear of the property features an open plan kitchen / dining area which leads to the south east facing rear garden. The custom built kitchen has been finished to the highest standard with granite worktops and a feature island unit to the centre and with a large utility room off. The dining area is filled with an abundance of natural light from the large roof window and the floor to ceiling glazing and doors to the rear. A double sided multi-fuel burning fireplace bisects the dining area and the cosy TV room. 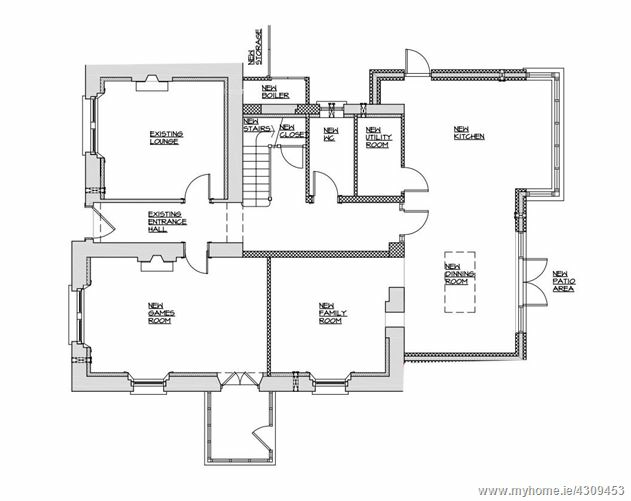 A downstairs WC and understair storage also feature off the hallway on the ground floor. 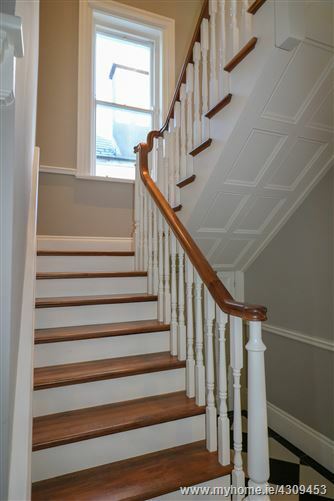 Taking the beautifully crafted solid wood stairway to the landing, there is access to the attic, a family bathroom and the four large double bedrooms that feature on the first floor. 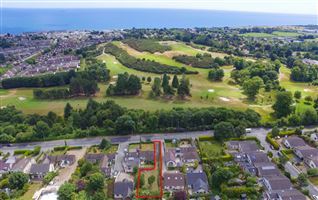 There is an ensuite and large walk-in dressing wardrobe in the master bedroom which also enjoys views of bray head and the surrounding coastline. The second bedroom boasts magnificent views of the sugarloaf mountain and is filled with natural light. 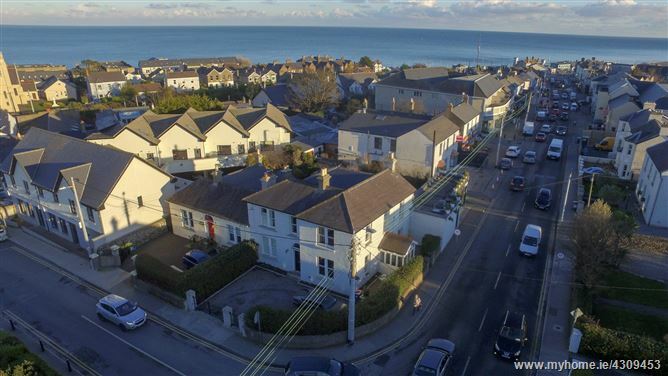 Bushfield House is situated in a prime location close to an array of wonderful amenities that Greystones town and harbour has to offer. The town is quite literally on your doorstep and all your needs will be catered for with a wonderful selection of bistros, boutiques, restaurants and shops, the village library, churches and a large number of highly regarded schools. The new Harbour Marina is just a five minute walk where one can avail of number of restaurants and cafés and also access the cliff walk between Bray and Greystones. A host of sport and leisure clubs abound in the area including sailing, rowing, football, rugby, tennis and GAA. The Shoreline Leisure Centre and swimming pool is close by, as are a great choice of renowned golf clubs, including Greystones, Powerscourt and Druids Glen. 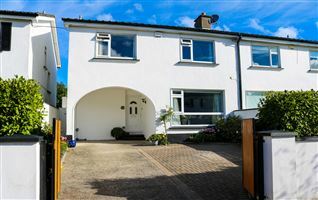 The commuter will be delighted at the ease of access to local bus stop which is across the road and the DART station just a two minute walk away. The N11/M50 is also within easy reach making for an easy commute to the city, airport and beyond. Tiled flooring. Glazed porch with access to Church Road. Tiled flooring. 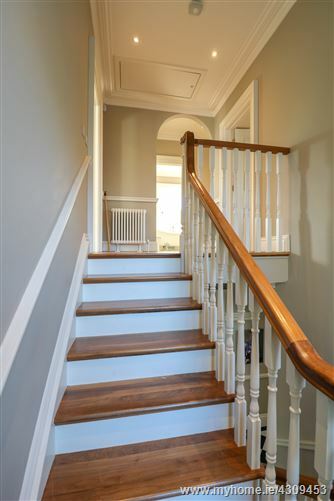 Solid wood stairs to landing. Bespoke solid wood built-in shelving unit. Decorative coving and cornice. Understair storage. Dodo rail. Alarm panel. Wood effect tiled flooring. Feature open fireplace with cast iron surround, tile inset and polished black slate hearth. Double door to porch. Two large sash windows allow natural light fill this room. Wood effect tiled flooring. Feature open fireplace with marble mantle, cast iron inset and surround and polished black slate hearth. Tiled flooring. Bespoke kitchen featuring large island unit. Black granite countertops with range of floor and wall based solid wood storage cupboards. Integrated appliances with Rangemaster cooker and hood. Built-in larder unit. Door to side. Recessed lighting. Underfloor heating. Tiled flooring. Countertop space with stainless steel sink unit. Wall based and floor based storage cupboards. Extractor fan. Tiled flooring with underfloor heating system. Double doors to rear garden. Multi fuel burning stove. Feature skylight allows an abundance of natural light fill this area. Wood effect tiled flooring. Feature double side multi fuel burning stove. TV point. Tiled flooring. Wooden clad panneling. Pedestal wash hand basin. Decorative coving. Extractor fan. Solid wood flooring. Stira stairs to attic. Recessed lighting. Solid wood flooring. 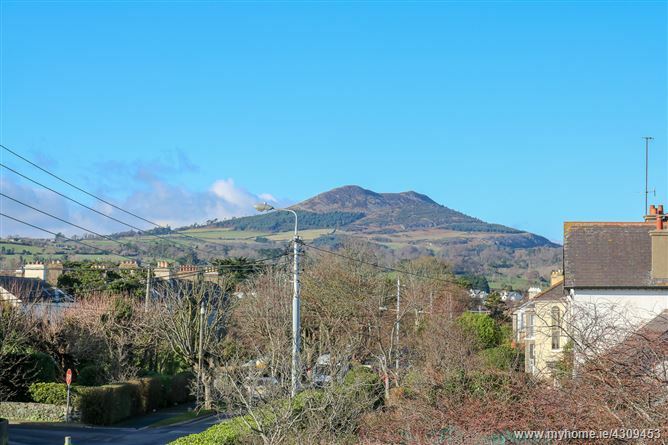 Two large picture windows with stunning views of Bray head and coastline. Walki-in wardrobe with solid wood flooring. Tiled flooring. Part tiled walls. Chrome heated towel rail. WC. Wash hand basin with storage under. Extractor fan. Fully tiled double shower. Recessed lighting. Solid wood flooring. 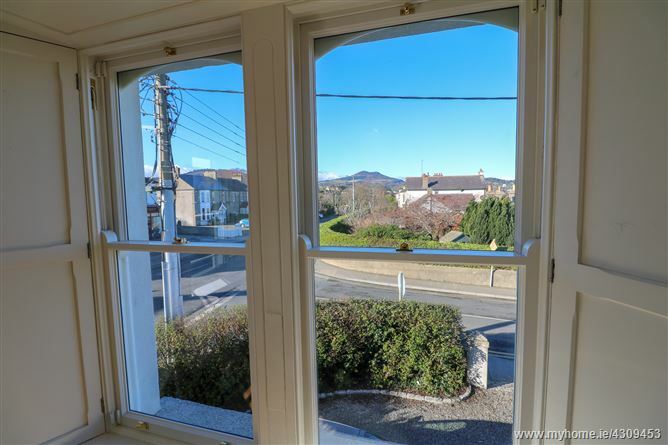 Three large sash windows with stunning views of the Sugarloaf mountian. Built-in wardrobe. Solid wood flooring. Feature fireplace with cast iron mantle and surround, tile inset and polished black slate hearth. Solid wood flooring. Built-in wardrobe. Tiled flooring. Claw footed bath. Wash hand basin with storage under. Fully tiled shower unit with power shower. Wooden clad panelling. WC. Chrome heated towel rail. Recessed lighting. Extractor fan. Bushfiled House is approached via electric gates on to a gravel driveway which provides off street parking for three cars. This completely private rear garden is accessed via the dining area or alternatively via the kitchen. This is a tiered garden with lawn area and large granite patio with an array of mature shrubs and plants featuring around the garden. Access to Church road. Boiler room access to side garden. 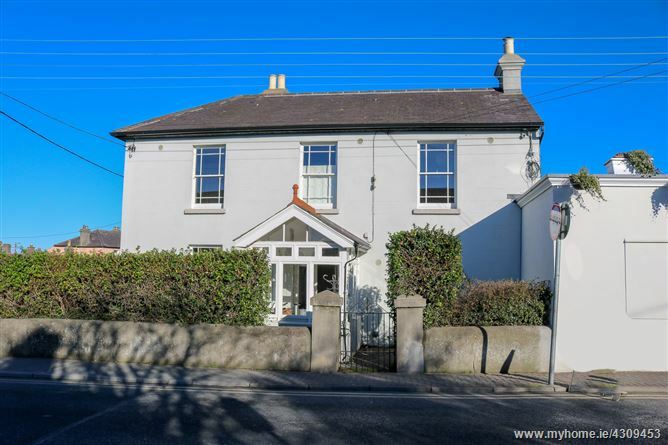 Bushfield House is located at the top of Greystones Main Street and can be identified by the McGovern Estates ‘For Sale’ Sign.